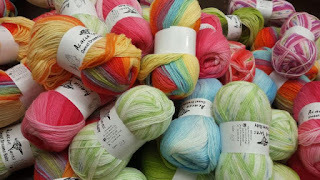 Yarn and Fiber Happenings: Vivivan Hoxbro Rocks! 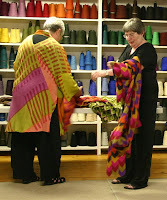 So what do you do when at 3:00 in the afternoon you find out that there is a designer that is lecturing at Harrisville Designs which is about 1 1/2 hours away that evening at 7:00? You call everyone you can think of and pray someone can go for the last minute road-trip! We called all the staff, but only Carin and I were able to make this trip - and what a joy it was.... Vivian Hoxbro is extremely talented and just as nice! 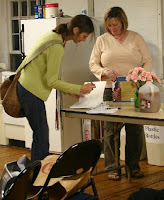 This is a picture of Vivian with Pat Cowley - owner of Harrisville Designs. Vivian lectured on her life and her road to find her creative path to become the awesome designer that she is today. 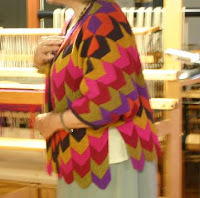 Her designs are not only colorful, but very functional - for example, we tried on her garments (Yes! She had one of every colorway of every garment that is in her Domino and Shadow collection as well as her kits - and we all tried them on!) and every garment is designed to lay across your back and over your shoulders and fit just right - in other words, shawls were shaped at the neck to hug your neck and follow the line of your shoulders and arms so the shawls didn't slump or fall off as you wore them. Ah.... it was amazing! Carin and I both were "dressed" by Vivian - she was more than happy to come over to us and show us the different ways garments could be worn and at the end of the lecture - after we had said goodbye and thanked her and I think we were gushing (we felt like little kids and were simply awestruck - we returned one more time to ask her her opinion on what colorway we should use for the shawls we picked out to make. Vivian has a new shawl pattern coming out that both of us just love - Vivian picked the Periwinkle Blue for Carin and the Fern green for me to use for our shawls... Patterns are due out for this shawl in a couple of weeks and they are made using the Silk and Wool Blend at Harrisville Designs. I am going to have to get some of this yarn in soon... Possibly in time for The Knit and Crochet Show in Manchester! 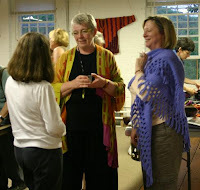 Wish I was there taking the class this weekend - Pam Allen, (author of Lace Style, Scarf Style and Wrap Style, formerly of Interweave Press and now with Classic Elite) is there taking the class - we met her this evening and she was extremely nice and kind enough to sign our books. And it was a pleasure, as always, to see the Harrisville Group, John, Pat and Rae, great job! We both thought it was a great night all around! Now onto all the wonderful pictures! If you double-click on the pictures they should enlarge to full screen size so you can view all the garments in their full glory! Have fun - we certainly did!